We invite you to explore India - the Land with infinite beauty ! Whether you soar high into Himalayas or peer under the ruins of the Ancient monuments dotting the landscape of India, you will cherish the experience long after your visit ! This India Travel Guide on Hemkund Sahib Gurdwara is free from any commercial interest! This site is dedicated to promote India - the vast subcontinent, its glorious past, magnificent landscape and its infinite variety. Located 4362 feet above sea level, Hemkund Sahib is a Sikh Gurudwara in the Chamoli district in Uttarakhand. The Gurudwara can be reached only on foot after Gobindghat on the Rishikesh-Badrinath highway. The Gurudwara is 19 km from Gobindghat. It is surrounded by seven mountain peaks and each of the peaks is embellished by a Nisan Sahib on its cliff. These seven peaks are known as Sapt Sring. These include Rudra Himalaya, Bishanpuri, Udgari Kanth, Sarga Rohan, Brahmapuri, Mer and Sumer. Hemkund Sahib is about 40 km from the China border. 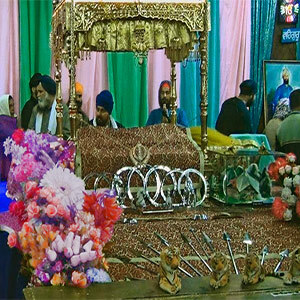 This Gurudwara holds importance for Sikhs who believe in the Dasam Granth. Hemkund means snow bowl in Sanskrit and this place is a snow bowl alongside a glacial lake; Amrit Sarovar. Though the lake remains frozen throughout the year, pilgrims take a holy dip in this lake. Hemkund Sahib Gurudwara is star shaped and is the highest located Gurudwara. As legend has it, Guru Govind Singhji, the tenth Sikh Guru meditated here for a few years. Pandit Tara Singh Narotam traced the geographical position of this Gurudwara during the 19th century. Sardar Sohan Singh, a retired person from the Indian army found this place in 1934 and constructed a Gurudwara in 1936. Close to the Gurudwara is a temple dedicated to Lakshmana, brother of Lord Rama. The trek from Gobindghat takes one through pine forests, wild roses, ferns and alpine flowers. View the spectacular waters of the Lakshman Ganga. The last five kilometers of the trek is a steep climb from Ghangharia. This place is a base for people visiting Hemkund. Hemkund is inaccessible from October through April due to heavy snowfall which is nearly 30 - 35 feet. Every year Sikh pilgrims who visit this place during May undertake the repair work; as part of Kar Seva or work service. From Gobindghat enroute Hemkund you find another Gurudwara at Ghangaria, This place also has few hotels and a campground with tents for accommodation. The road to Gobind Ghat passes through the Panch Prayag - the five sacred river confluences. These temple towns are locations where the major tributaries join the Ganga. As there is no accommodation at Hemkund, people have to leave the place by 2 in the noon so as to reach Gobindghat by nightfall. Gobindghat is well connected by road. The nearest railway station is at Haridwar/Rishikesh. The nearest airport is at Dehradun. Local transport is horse or pony. Helicopter tours are available between June and September. This service is between Gaucher and Ghangaria/Govind Dham. Carry sufficient woolens and wear sturdy trekking shoes. Have a first-aid kit, water and a torch, as there might not be electricity all through the night.